Yuba lake is one of favorite places to go, we are found there often because of the Sandy beaches and is easy access from highway 15. Yuba Lake is only 20 minutes from Nephi Utah and only 1 hour drive from Utah County making it a great option for a day on the beach. This is one of our families favorite spots because of the nice camp grounds at Oasis Camp grounds inside Yuba Lake State Park not to mention the nice facilities for showers when the day is over. We love to come and go on our early runs from the boat dock and after noon hang out at the beaches on the North side of the lake. There are also boat in camp sites and docks that are a great addtion to what the lake has to offer. Looking for something new and exciting to liven up those summer months? Let TK Watersports bring your summer to life. Come try your hand at wakeboarding, wake surfing, water skiing, wake skating, knee boarding, tubing, power boat rentals, wakeboarding boat rentals, water ski boat rentals and more. Experience the rush of being pulled behind the latest in wakeboarding boats with top of the line water sports equipment. Whether you are a beginner or just trying to take it to the next level, TK Watersports can take care of you. we are also your personal watercraft and RV rental connection. Available through TK Watersports are jet ski rentals, wave runner rentals, and Sea Doo rentals. 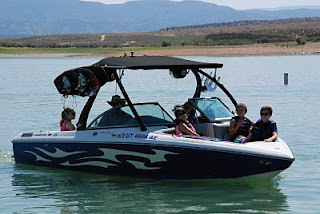 We offer power and performance on one of our competition wakeboard boats/water ski boats. Rent an RV, motor home, travel trailer, boat and wave runner and experience the ultimate water sports vacation. Reserve one of our vacation packages to your favorite lake. come to us for your rental needs. With TK Watersports there is something for everyone, young and old alike. We can handle riders of all skill levels; even if you’ve never been on a boat. If you’re ready to get out there and water ski, wakeboard, tube or try the newest sensations wake surfing and wake skating, TK Watersports is here for you.